To gain an understanding of collision theory. To gain an understanding of the four main factors that affect reaction rate. Reaction kinetics is the study of the rate of chemical reactions, and reaction rates can vary greatly over a large range of time scales. Some reactions can proceed at explosively fast rates like the detonation of fireworks (Figure 17.1 “Fireworks at Night Over River”), while others can occur at a sluggish rate over many years like the rusting of barbed wire exposed to the elements (Figure 17.2 “Rusted Barbed Wire”). 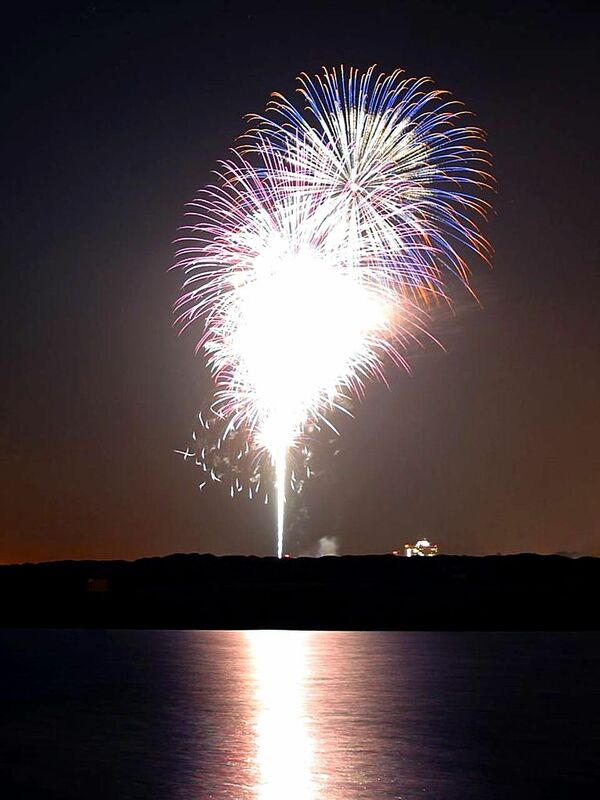 The chemical reaction in fireworks happens at an explosive rate. 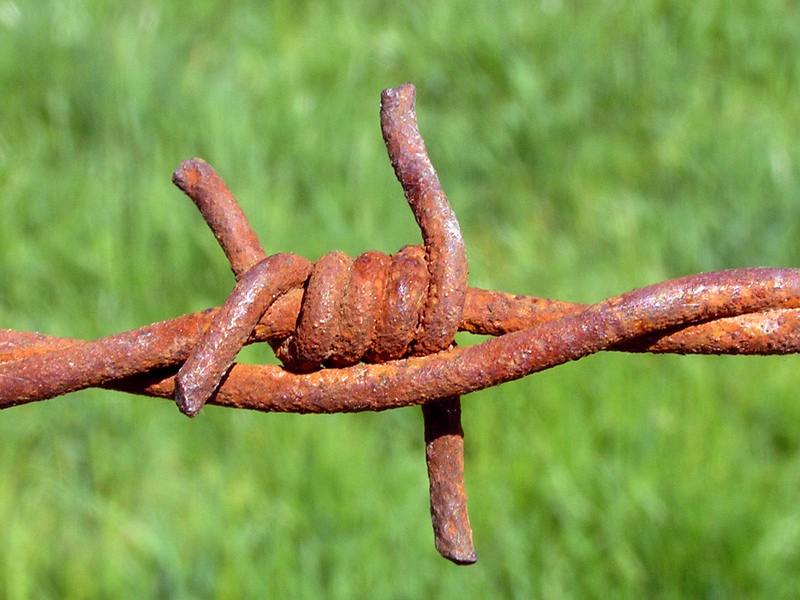 The rusting of barbed wire occurs over many years. To understand the kinetics of chemical reactions, and the factors that affect kinetics, we should first examine what happens during a reaction on the molecular level. 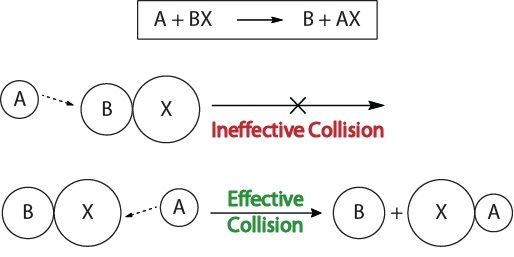 According to the collision theory of reactivity, reactions occur when reactant molecules “effectively collide.” For an “effective collision” to occur, the reactant molecules must be oriented in space correctly to facilitate the breaking and forming of bonds and the rearrangement of atoms that result in the formation of product molecules (Figure 17.3 “Collision Visualizations“). This visualization shows an ineffective and effective collision based on molecular orientation. During a molecular collision, molecules must also possess a minimum amount of kinetic energy for an effective collision to occur. This energy varies for each reaction, and is known as the activation energy (Ea) (Figure 17.4 “Potential Energy and Activation Energy“). 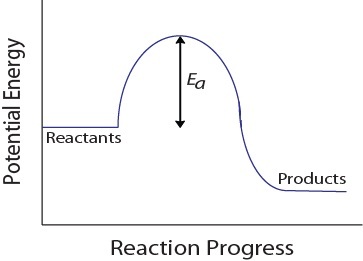 The rate of reaction therefore depends on the activation energy; a higher activation energy means that fewer molecules will have sufficient energy to undergo an effective collision. This potential energy diagram shows the activation energy of a hypothetical reaction. 1. Reactant concentration. Increasing the concentration of one or more reactants will often increase the rate of reaction. This occurs because a higher concentration of a reactant will lead to more collisions of that reactant in a specific time period. 2. Physical state of the reactants and surface area. If reactant molecules exist in different phases, as in a heterogeneous mixture, the rate of reaction will be limited by the surface area of the phases that are in contact. For example, if a solid metal reactant and gas reactant are mixed, only the molecules present on the surface of the metal are able to collide with the gas molecules. Therefore, increasing the surface area of the metal by pounding it flat or cutting it into many pieces will increase its reaction rate. 3. Temperature. An increase in temperature typically increases the rate of reaction. 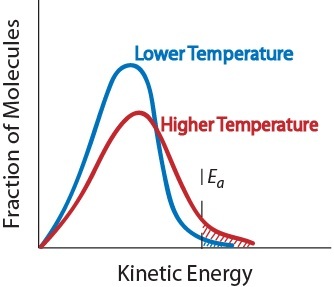 An increase in temperature will raise the average kinetic energy of the reactant molecules. Therefore, a greater proportion of molecules will have the minimum energy necessary for an effective collision (Figure. 17.5 “Temperature and Reaction Rate”). Reactions occur when two reactant molecules effectively collide, each having minimum energy and correct orientation. Reactant concentration, the physical state of the reactants, and surface area, temperature, and the presence of a catalyst are the four main factors that affect reaction rate. Factors that Affect the Rate of Reactions by Jessie A. Key is licensed under a Creative Commons Attribution 4.0 International License, except where otherwise noted.